Catlin was born in Wilkes Barre, Pennsylvania. Even in his early years, Indians had a strong influence on Catlin’s life because his mother had once been captured by them. He was educated at home and collected Indian relics. Trained as a lawyer, Catlin gave up that profession to devote his career to painting Indians in their native land and he spent the rest of his life championing their cause. Catlin was a self-taught artist who started painting portraits of political figures. Inspired by an Indian delegation passing through Pennsylvania in 1824, he decided that Indians and their culture would be his primary subject matter. In 1831 Catlin set off for St. Louis and became friends with General William Clark. Catlin sketched and painted Indians who visited Clark at his office. Catlin was in Nebraska twice; once in 1831 and again in 1832. In 1831, Catlin ventured with Major Jean Dougherty on a trip up the Platte River. 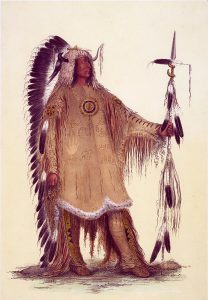 While on this trip Catlin made numerous sketches of the Indians in the area. Later he traveled up the Missouri to Ft. Union on a steamboat but returned by canoe to sketch places he had missed. The paintings from this trip he presented to Congress in 1838, only to have them rejected. Catlin took his works to Europe where they were much more admired. The remaining years of his life he spent traveling and trying to persuade the American government to buy his paintings of the American Indians.